Learn Ballet, Tap & Modern Dance In A Fun, Exciting, Caring & Friendly Environment. Looking for an enjoyable and creative activity to keep your child entertained and help them develop? Claim your free trial dance class at top Kenilworth dance school Eclipse Dance. We’d love to see you. All girls and boys aged 2½-10 are welcome. When? Saturdays in term time. Where? At Kenilworth School’s purpose built dance studio. How? Simply download your free trial dance class voucher on this page. Then simply come along, show your voucher at the front desk and see how your child gets on. We’ll send you all the information you need once you’ve downloaded your voucher. Every week children get to try Ballet, Tap & Modern in a single unique class. Parents tell us they really like the chance for children to try three different dance styles every Saturday. Children can also work towards graded exams with the IDTA, Rosette and StarDance Awards, dance festivals and performances. All dance classes are taught by Eclipse Dance founder & principal, Miss Jane. Jane is a former professional dancer and is a professional choreographer. Find out more about Miss Jane below. Read what parents think of Eclipse Dance in the reviews section below. Claim your free trial voucher on this page, we will then send you further information. You will also then have the chance to ask any questions via email or phone. DBS Checked & Fully Insured. We Fully Respect Your Data. Come and have a try, no obligation at all. We’d love to see you there! Once you’ve claimed your free trial class, we’ll email you class times and other details, based on the information you’ve sent us. Please note: spaces are limited and class places will be taken on a first come, first served basis. We need to know your child's DoB so that we know which class your child is likely to attend. This makes it easier for us to work out your child's age. All dance classes are taught by Miss Jane, Founder & Principal of Eclipse Dance. 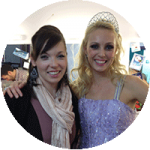 What did this BBC Strictly Champion say about working with Miss Jane, the founder of Eclipse Dance? Jane is a former professional dancer and is a professional choreographer. Eclipse Dance is a member of the International Dance Teachers’ Association -one of the world’s largest dance examination boards. Miss Jane knows what it takes to win at dance festivals. She has adjudicated at dance festivals across the country.